Located virtually on the equator, Singapore offers a wide variety of fresh fruits year round. Although many tropical fruits are harvested year round, a small number of them are seasonal. When I lived in Singapore I used to follow these seasonal fruits like people in temperate climates follow changing season. Among the seasonal fruits, mango is the one I always eagerly anticipated. Its season starts at the end of the dry months, which is around July. Local mangoes start appearing in the markets around August and continue to be available through October. Of all the mangoes available during this annual season, my favorite is an Indonesian variety called Arum Manis, which began to be available in Singapore in the 1980’s. The fruit is elongated in shape but the skin remains green even when ripen. The flesh however varies from yellow to orange and has an incredibly intoxicating fragrance. I would always consume them fresh and unadulterated. It is simply too delicious to be used in cooking or processing. There is no justification for it. Here in the U.S. mangoes are now available year round. But the best time for them is between May and September. 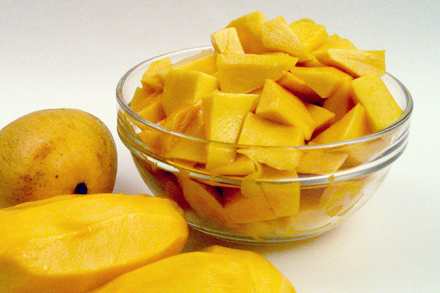 That’s when the best quality and most varieties of mangoes from the Caribbean become available. They are bountiful in New York Chinatown currently. I especially like the Haitian variety. They are sweet, fragrant and less fibrous. Although I enjoy them fresh, they are also excellent for making mango pudding. Mango pudding is one of those dishes that were created by Cantonese chefs in Hong Kong to satisfy the modern demand for Chinese desserts. Although it is not a traditional dish, it is a refreshing and delicious creation. I consider it to be one of the most successful creations by Chinese chefs in fusing Western dessert tradition and Asian ingredients. Use fresh ripe Haitian mangoes if you can find them. Skin the fruit and cut the flesh of the mango into about two or three-inch square pieces. Put the pieces into a blender and puree. You will need about two medium size mangoes to make 1 1/2 cups of puree. Put the gelatin in a glass bowl and soften with the hot water. Let stand for about 3 minutes. Then add the evaporated milk and the sugar and mix until the sugar is completely dissolved. Next add the mango puree and mix well. Add the fresh mango cubes if you desire and mix. Put the mixture into a non-reactive mold made of glass or plastic. Chill in the refrigerator over night. 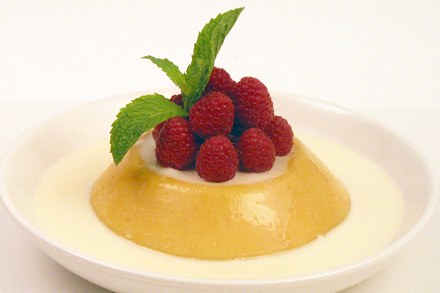 To unmold the pudding submerge the mold in hot water for about 30 seconds. Turn the mold over and unmold onto a shallow dish. Serve topped with additional evaporated milk. Mangoes are so different! Not everybody realizes that. I love Thai, Indonesian, Pakistani mangoes…the Mexican ones taste both powdery and musky to me, very unpleasant. I will try this recipe and let you know. My complaint with the ones at the dimsum places when I was growing up is that they were always bright orange but almost never tasted of mango. Mango pudding is one of the most underrated “dessert” in Chinese cooking. Done well it is really flavorful and refreshing. Michele, you’re right that mangoes we get here in the U.S. are just tasteless. I do understand Indian mangoes are now available. I’d love to be able to get hold of some. How much is 3 packet of unflavoured gelentin? The envelope size for Knox gelatin is 1/4 ozs. I looked at this recipe as it was listed under “vegetarian.” Unfortunately, gelatin is a product derived from cooking down animal bones, thus, making this dish non-vegetarian. Would it be possible to substitute agar-agar or arrowroot for the gelatin in this recipe? Thanks! Yes, you can substitute gelatin with agar-agar. In fact in Asia agar-agar is used for making pudding. You’re also right that this recipe is not vegetarian in its curent form. I recommended gelatin only because it is more readily available in the U.S. I usually use .5 oz of agar-agar for every quart of liquid for creating good texture. I hope this is helpful to you. I live in L.A. and the Mexican mangoes I get are great. I’ve also travelled extensively throughout Mexico, and the mangoes there are even better. I will certainly try this recipe. Fortunaely I tried only half recipe from About.com, Chinese Food. It didn’t set at all, only the top layer, and overnight, it’s still the same. Then it says there to eat it best on the same day. Wonder why. I’ll give you feedback after I’ve tried, but right now have to stomach this first, not to waste. I’m so glad I stumbled upon your recipe. I made the mango pudding over the weekend and it was marvellous. I strained the mango mixture before putting them into the ramekin. Thank you. I’m glad you enjoyed the mango pudding recipe. I think classic mango pudding is still one of the most satisfying refreshing dishes among the dimsum offerings. hi there , i have some asian agar agar stick and needs to melt in warm water , could you please advise the equivalent in quantity as oppose to gelantine powder. As i prefer to use agar agar since it is an vegetarian options . Hi May, For this recipe you can use about .3 oz. of agar agar to thicken. You may want to experiment the amount to suit your own preference for texture. hey, if I want to use agar agar, how will the cooking method differ? thanks, it looks realy delicious. Hi Kezia, The cooking procedure with agar agar is similar. You will have to bring the water to a boil to completely dissolve the agar agar. 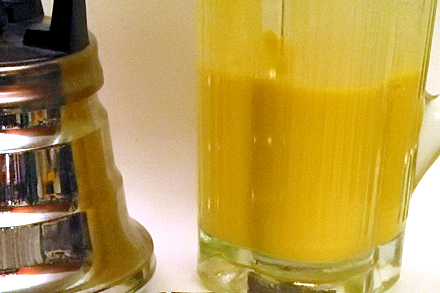 Let cool to almost room temperature before mixing in the mango puree. Otherwise just follow the other instructions. I hope you enjoy the pudding. Hi Kian! Thanks for the recipe. I’m planning to make this later with agar-agar. When you mentioned 0.5oz per quart of liquid, were you referring to the agar sticks? I only have agar powder in hand, should I follow the agar:liquid ratio on the back of the box then? It says 6 cups of water per agar box(6oz). I used it with 6 cups of pandan water before, and it was really really hard, unlike gelatin which was more jelly-like. I tried using 1oz of the same agar powder for almost 6 cups of pandan water yesterday, and it never set. I made the agar agar proportion recommendation based on agar powder I bought from Chinatown, and not based on agar sticks. Based on the manufacturer’s directions you described I would try using 2 oz. of the agar powder and use 1 cup of water and 1 1/2 cup of the mango puree. The texture of the pudding will be slightly different when made with gelatin versus agar agar. I’m afraid my best advice is to experiment. Good luck! For 580g mango puree, how many gelatin should I use. I used Knox unflavored gelatin from Wal mart. I used 4 small packs, but it was not firm enough. Thanks. Hi Wendy, My estimate for 580g of mango puree is a little over 2 cupful. Four packets of 0.25 oz. of Knox unflavored gelatin should be sufficient. If the mixture is still not firm then add one additional packet. I hope this helps. thank you for the Recipe. It’s summer time and I would love to make this dish. I will be using delicious Ripe Mangoes from Cebu Philippines. I will update you with the outcome. is it true tho that gelatin is made of animal bones? I thought they were from seaweeds? You are correct that gelatin is made from animal skin and bone, which contain collagen. Agar agar on the other hand is made from seaweeds. So for a pure vegetarian version you should use agar agar. Hi Kian, just want to know how much is 1 cup equivalent to ml or Oz? how many servings can this recipe make? This recipe can easily serve six. Enjoy the pudding! Hi, may I know if your pudding is more of jelly like or mousse like? This mango pudding recipe is more of a jelly variety. Hi, can i knw how many grams us 3 pkts of gelatine? Each packet of gelatine in the U.S. is 0.25 oz., which is approximately 7 g. in metric. So three packets weigh about 21 g.
Would I look for “21g of unflavoured gelatin” if I don’t know how much is in one packet? (As I’m in the UK not the US). But thanks for the recipe, definitely will try this in the next few days! Yes, that is correct. Get unflavored gelatin and measure out 21g for the recipe. To make this a completely vegetarian dish use about 0.5 oz. or 14 g. of agar powder. Enjoy! Subscribe to our newsletter and be informed of what's going on with events and accouncements from Red Cook.